Here are some brief notes on my hook making process, or hook re-working process to be more accurate. It is very similar to Eugene Sunday’s methods. I’ve included notes from Gene and a couple of other sources for review as well. These might help get you going. 1. Using a propane torch, I heat the hook to a hot orange-red to remove the temper. This usually requires two steps as I cannot heat the entire hook at once. They’ll cool fairly rapidly so you can begin the next step in a short time. 2. I use fine point needle-nose pliers to straighten the ring eye out as straight as I can, though it’s not mission critical at this point. 3. I work the eye area with a pair of long-handled flat-nosed pliers (you need the torque of the long handles – I found a pair at the local hardware for around $15). 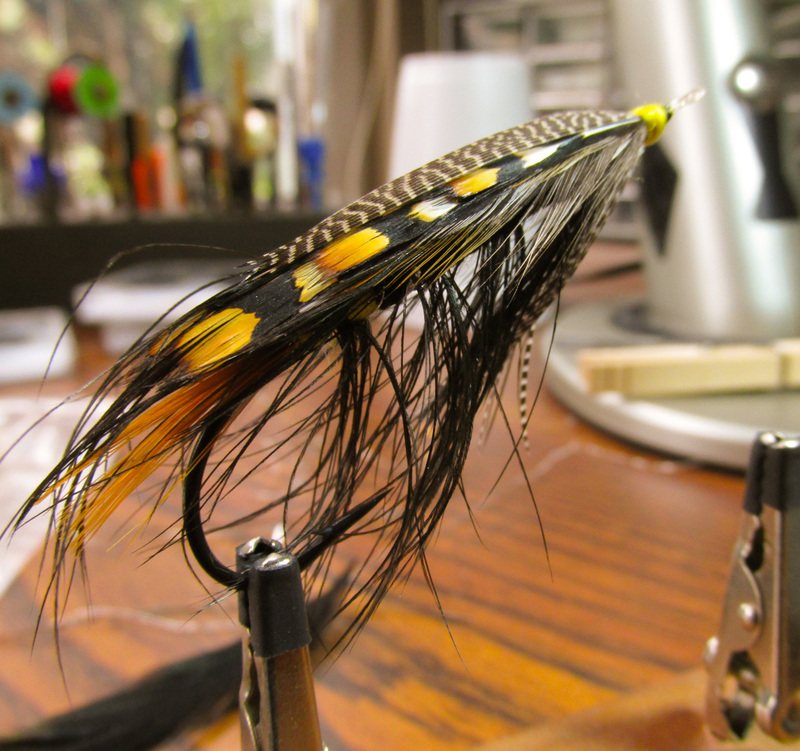 I crimp the eye from all sides and then clamp down hard on the shank while turning the hook with my free hand. I try to remove any bends in the shank at this stage, though small ones can be removed when we grind the eye area into a taper. 4. If desired, take a small pair of needle-nose pliers and give the hook point a slight bend downwards. I do this first because this is the most likely step where the hook my break. No use wasting time on the rest if the point breaks off. 5. Using my hook templates, I start shaping the hook to give it the general appearance I want. This would be the time to use a bending block, but I generally do most of this work by hand. Creating your own bending blocks gives you a template from which to work and would aid in consistency as you create additional hooks. 6. Filing: now I start to work over the barb and point as described by Gene in his notes. So many of today’s commercial hooks have utterly awful globs of steel for the point. We can get a much more refined look with a little strategic filing. 7. Taper the hook shank. Run the front of the shank over a bench grinder (I mount a Dremel tool for this purpose – it’s a bit slower, but I have more control and can achieve the desired results), working around the shank to taper it to your liking. 8. Final shaping. Since I’ve probably lost the exact shape I had prior to filing and grinding, I once again match the hook to my template and work it into the final shape. 9. Re-Tempering: in two steps, I heat the hook to a hot orange-red, then quickly submerge it in a jar of motor oil. Some use ice water, but I think this makes the hook more brittle. I usually heat half the hook and cool it, then the other half. 10. After it has cooled, heat the hook again (in two steps), but not to a hot orange-red. Aim for brown or light red, then submerge it in the oil bath again. I just dunk it in while holding the hook with pliers so I don’t have to fish it out. 11. Clean the cooled hooks with steel wool, maybe a fine sandpaper, and a light buffing wheel if desired. 12. Soak in a jar of acetone a few hours, though I usually leave them overnight. This will lightly scar the steel and prepare it for the paint. 13. Painting the hooks is the tough part. Some dip the hook in a diluted paint mixture; I use spray paints. You want a high-temp paint like a stove or engine paint with a rating of at least 500 degrees. I’ve found a high-temp lacquer that leaves a very shiny finish, and one that produces a matte finish that I really like. I made a little holder by drilling out holes in a block of wood. I have small ones on the side so that I can insert the blind-eye or the hook point while I give it a light spray coat. Careful not to overdo it here. Then reverse the hook and cover the remaining portion. I usually have to apply 3 coats or so because I go pretty light on each application. In warm weather or a heated environment, this can easily be accomplished in an hour or two. 14. I place my hooks, eye-first, in the top of my painting block (I don’t use this portion for the painting so I don’t have to worry about paint build-up here that will melt on to my hooks when baking them). These holes are bigger and deeper so that there is no pressure on the hook. It just sits there easily. 15. I place the block with my half-dozen or so hooks in a toaster oven and bake at 400 degrees for 30-40 minutes. You can play with the temp and the duration a bit to get the finish you want, but this seems like a good setting for me. The higher the temp and longer you bake, the harder the finish. 16. Allow to cool for a couple of days (I think Gene recommends two weeks) and then tie away! I find that once I get going on this (and it isn’t that often since I’d rather tie), I usually have a few hooks at each stage of the process. That way I can get quite a bit done in my limited time. I usually work in batches of 4 or 6 – certainly not much of a high production line! What to Use For Hook Stock? You can use most any large hooks that give you enough material to work with. Large saltwater and salmon irons are a good place to start. I know some makers who use piano wire to formulate their hooks. I located an online supplier of annealed steel wire in various gauges that would be suitable for this purpose. The additional step in this process, of course, would be to use a chisel to form the hook barb itself. A little additional filing and you would control the hook size and shape from start to finish! If you wish to embark on this journey, I wish you good luck and much fun creating hooks of all shapes and sizes for your tying desires. It’s McMaster-Carr. They have different gauges of steel wire that some of the hookmakers I know like to use. Here’s a link to their steel wire page: http://www.mcmaster.com/#metal-wire/=ogvln5.